Obesity: Post Mortem is fascinating. It’s not for everyone, perhaps: there are people who would rather bathe in kale chips for a year than see a dead body cut open. But for those who can stomach it, I highly recommend watching it. The show offers a rare glimpse into the inner workings of an obese body. I’ve researched heart disease and type two diabetes for blog series on those topics and I have to tell you, I felt like Buddy in Elf when he sees Santa: “I know him, I know him!” except I was yelling “I read about that! I read about that!” at the TV. It’s one thing to read about the heart working harder when you have high blood pressure and it’s another thing to see the physical heart of a woman who had high blood pressure and see how thin and weak the muscle was by the end. It’s one thing to read about how high blood pressure (and a weakening heart) leads to fluid build up in the lungs and it’s another thing to see a mortician squeeze water out of those lungs. It’s one thing to read about fatty liver disease and it’s another to see what an enlarged fatty liver looks like, each microscopic cell so full of yellow fat that the organ appears orange-pink instead of blood red. Obesity: Post Mortem proves that obesity does, indeed, affect internal organs. I don’t need to have faith that it does because I’ve seen it. That strengthens my faith in the logical opposite: exercising, drinking water, eating lots of vegetables and fruits and losing weight in the process is helping my organs. Obesity: Post Mortem is a strong motivator. Whether you’re working to lose weight or to maintain a healthy weight, Obesity makes you want to stick with those healthy habits. Living a healthy lifestyle takes faith that what you’re doing makes a difference. You can’t always see the effect of your efforts right away. You can do everything right– eat well, exercise, sleep adequately, drink water– and not loose a pound for weeks. You have to have faith that your body is reaping the benefits cell by cell, system by system, on a level you can’t see yet. So, pull up a chair, skip the popcorn (it is an autopsy, after all), and enjoy the show! Last week we talked about global body shipping and how high blood pressure (also called hypertension) can damage our body. This week we’ll look at the leading causes of hypertension and what we can do about them. Atherosclerosis – This is a big word that I like to call Gather-old-Playdoh-sis. You know how new Playdoh is soft and pliable and so pretty you just want to eat it? That’s how blood vessels are supposed to be. 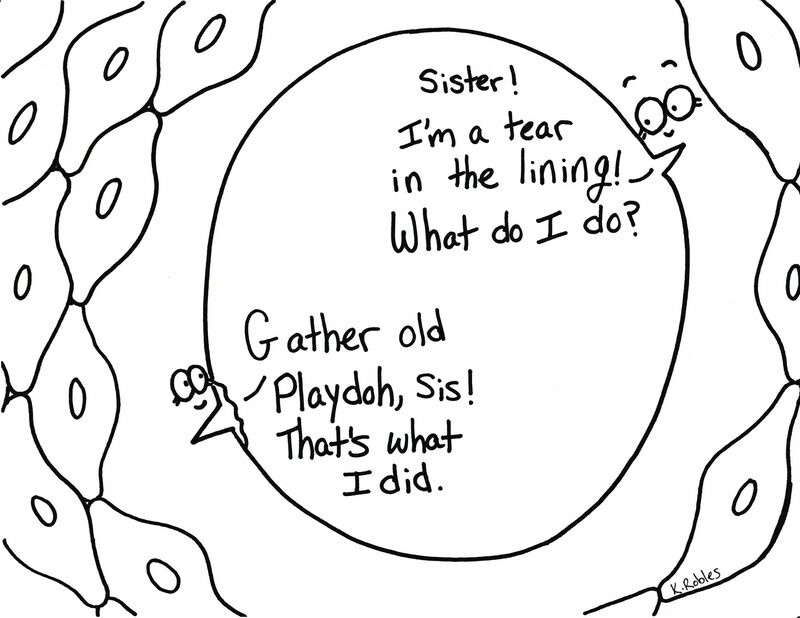 Over time Playdoh hardens and shrinks as it dries out and that’s what happens in your blood vessels. Blood vessel linings gets pot holes, cholesterol fills in the pot holes and hardens there like Playdoh, and then your blood vessel can’t expand and contract easily like it used to. Atherosclerosis can be prevented or slowed by exercising and eating a diet high in plant parts. Diet and exercise prevent pot holes from forming and reduce the amount of fat Playdoh in the blood looking for a pot hole. Science isn’t sure if hypertension increases atherosclerosis or if atherosclerosis increases hypertension. They do know that exercise and eating greens helps decrease both. It’s kind of like the “What came first: the chicken or the egg?” debate. Answer? Doesn’t matter; they’re both delicious. Eat your greens and move your body and don’t worry about it. Sleep Apnea – More than half of people with hypertension also have sleep apnea, so scientists are pretty sure there’s a connection. (Let’s face it: when we talk about the human body, there is always a connection.) High blood pressure can trigger sleep apnea which causes poor sleep or a lack of sleep which raises your blood pressure which can trigger sleep apnea. A doctor can direct you to a helpful mask to improve your sleep. You can also lose weight and exercise. Smoking and Drinking – Stop smoking and don’t drink more than 1-2 alcoholic drinks per day. Yes, I am a party pooper. Too much salt – Remember how your blood vessel walls are made of smooth muscle? Blood pressure is all about those wall muscles being able to relax to let blood flow. For the walls to relax and contract regularly, they need regulators: namely the Three Musketeers (or the Three MagCalPots): magnesium, calcium, and potassium. There is a connection between hypertension and insufficient magnesium, calcium, and potassium and it may have something to do with salt. You see, Salt is supposed to be the fourth musketeer, but he went off and recruited so many many many of his friends that they turned evil and wrought havoc. 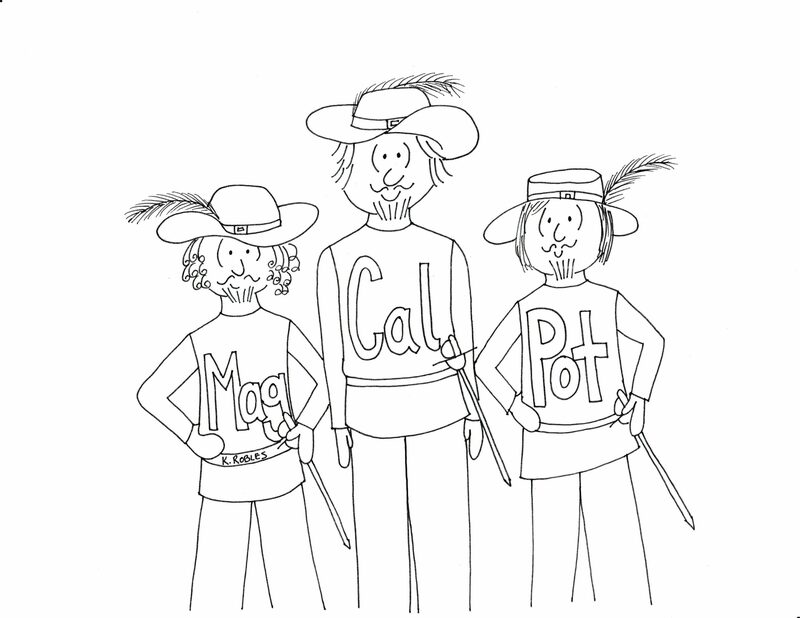 The Three Musketeers must be present to balance out Salt and his friends; if there aren’t enough of the Three MagCalPots, then Salt wins and blood pressure goes up. You can help the Musketeers by putting less salt and more magnesium, calcium, and potassium in your mouth. By the way, it’s recommended that you eat no more than 1 teaspoon (2300 mg) of sodium (salt) each day. The ideal goal is 1500 mg, but Americans eat so much sodium that even cutting down to 2300 is a plus. Be aware that 75% of the sodium most of us eat is in processed, pre-packaged, and restaurant foods, not the salt shaker. Genetics and Family History – hypertension runs in the family. If hypertension runs in your family, it’s even more important that you exercise and eat well. Sorry. Maybe you also inherited a sharp wit or great hair. Note: I should to point out that the medical community isn’t 100% sure what causes hypertension. They observe connections between hypertension and heart attacks, atherosclerosis, sleep apnea, etc., and make highly educated guesses. They also observe the connections between healthy habits and improved hypertension and make highly educated recommendations. What is 100% certain? We can take hypertension as the warning sign it is and make healthy changes. All these changes stressing you out? Take Heart: Stress and Heart Health is next week. As I research heart health, two foods keep coming up as good for your heart: leafy greens and beans (red and yellow, black and white, they’re delicious in our sight). So in honor of heart health, here’s a quick, easy, tasty recipe for Beans and Greens. Heat oil in 6 quart stock pot over medium heat. Saute onions for 2 minutes. Dissolve beef bullion in water, add to pot, and stir. Add garlic and kale, stir, cover and cook 5 minutes. Add broccoli slaw and beans, stir. Cover and cook 5 minutes. Salt to taste. Top with Parmesan cheese and serve.